I love Dell Mapbacks . . . the look, the feel, even the smell of them. A lot of people consider Gold Medal to be the all-time best publisher of paperback originals, and I can’t argue with that. But the Dell Mapbacks are my all-time favorite line of paperback reprints. So naturally when I ran across this one recently, I didn’t hesitate in grabbing it up. Not only did it have a fine Robert Stanley cover, but it’s also by Donald Hamilton, the author of the Matt Helm series and numerous other well-regarded hardboiled novels. I was a huge Matt Helm fan back in the Sixties, although I have to admit that the longer the books got, the less I liked them. I’ve also read a couple of Westerns by Hamilton that I liked quite a bit. 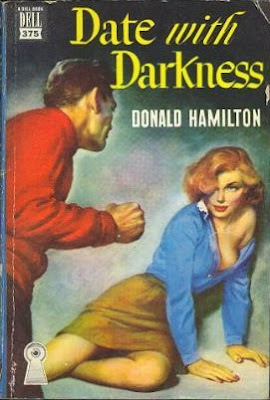 DATE WITH DARKNESS is Hamilton’s first novel, a post-war intrigue yarn that finds a young naval officer (who never saw action in the Pacific but sat behind a desk in Chicago pushing papers for the duration of the war instead) heading to New York on leave. He meets a beautiful young woman on the train, but she’s not what she seems to be and a bit of innocent flirtation plunges Lieutenant Philip Branch into a dangerous conspiracy, the roots of which go back to Vichy France. I hate to say it because I generally like Hamilton’s work so much, but DATE WITH DARKNESS is something of a disappointment. The plot is interesting, but it takes forever to develop. The writing is talky and static, without much action at all, and even the few action scenes are hard to follow. None of the characters are likable, even the hero. But the book certainly isn’t all bad. Here and there, lines and even whole scenes really sparkle, showing the promise of the writer that Hamilton would develop into, and he does a good job of creating an atmosphere of brooding menace. I’d give DATE WITH DARKNESS only a qualified recommendation, though. If you’ve never read any of Hamilton’s books, don’t start with this one. 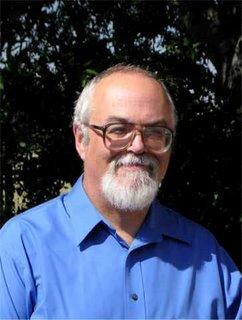 But if you’ve read and enjoyed his other work, it’s worth reading, for its historical value if nothing else. And hey, it’s a Dell Mapback with a Robert Stanley redhead on the cover. Money well spent, if you ask me. Just start off with Death Of A Citizen. That's Hamilton firing on all cylinders. Yeah, it's maybe the best of all the Matt Helm books, although you can't go wrong with any of the first nine or so. I've read the first 16 Helm books and, while the first is fabulous, I'd call the third, THE REMOVERS, my favorite. Absolutely astounding narrative drive, a villain so cruelly competent that he worries Helm, and one of the most cold-blooded climaxes of any novel I've ever read. I just finished Death of a Citizen. Excellent. I thought he really set the series up with a bang. 5 stars for attitude and character. I'm half-way through The Wrecking Crew, and I haven't been let down so far. Helm really is a fascinating character. I think I'm going to like all of the Matt Helms. I have also heard that "Line of Fire" is one of Hamilton's best books, period. I'm looking for that one on ebay right now.